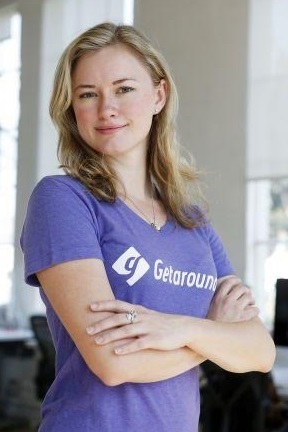 Jessica is the Founder and Director of Marketing at Getaround. She completed the inaugural class of Singularity University and is a founding member of the Global Shapers Community of the World Economic Forum. Jessica previously founded IDEAL, a non-profit focused on connecting young leaders with seasoned experts and worked in the Canadian Prime-Minister’s office as a writer and brand marketer. My background is actually in politics. I’ve always been really interested in and technology as a means of solving some of the world’s big problems. In 2009 I was accepted into the inaugural class at Singularity University - so I packed my bags and moved to Silicon Valley. It was a very exciting time and wound up propelling me into the tech world. Tell us about Getaround. What inspired the idea and what is your vision for the company? On day one at Singularity University, we were challenged by Larry Page to come up with a business that would positively impact one billion people in the next ten years. This was no small task, but when Larry Page says go, you go hard. Our team decided to start by looking at the global transportation industry, I realized the current model is unsustainable. There are one billion cars in the world, and on average, each car sits idle 22 hours a day. That’s 22 billion unused car hours each day around the world. Once we started digging in to it further, it was clear that we were going to focus on solving the obvious problem of “car overpopulation”. If we could find a way to improve the daily utilization of the average car, we would need fewer cars overall. This mean less resources spent on manufacturing, fewer cars on the streets and less cars rusting away in landfills. And just like that, Getaround was born. What strategic partnerships/marketing strategies have you implemented that have attributed to Getaround's success? Changing the way people perceive car ownership is a big challenge and partnerships have definitely proven to be a big success in validating the idea and spreading the word. Since day one, we’ve worked to partner with all levels of government to help drive adoption and policy changes to support car sharing. Recently, we partnered with the SFMTA here in San Francisco for a pilot program to provide dedicated on-street parking for shared cars across the city. We’ve also worked with several car manufacturers to help promote car sharing as an option for covering the rising cost of car ownership. To date, we’ve worked with Smartcar, Audi and Fiat. There is a trend that affects both the tech industry and the auto industry and that is the ability to get access to what you want instantly. People want things to happen quickly and when it comes to cars, they want a car when they need one. That’s just what we’re doing at Getaround, providing a real alternative to car ownership through instant car rentals. My personal motto is simple: hustle. It’s important to be scrappy and make things happen - if I took every “no” as the final answer, Getaround wouldn’t exist. Getaround’s goal is to empower people to car share, everywhere. Your greatest success as Founder/ VP Marketing of Getaround? That’s a tough one to answer. I’ve had a lot of proud moment in my time at Getaround. But if I had to choose, I would probably pick our launch (and big win!) at TechCrunch Disrupt - mostly because it was so fun! After three round of pitching, we won the Disrupt Battlefield competition and also won the People’s Choice Award. We hand thousands of sign ups in the following days and definitely drank our fair share of champagne too. Finding the right product-market fit is challenge for every company and it can be really frustrating along the way. We worked hard, and iterated many times before landing on our current on-demand model. It’s a tough process but really rewarding once you get it right. Hustle is what sets you apart from the crowd - have a lot of it and find great mentors to support you along the way. Describe the ideal experience using Getaround. A real alternative to car ownership. Our team is incredibly close, I know it’s cliché to say this but we definitely are like a family. I think that bond is what motivates our team. When you see another team member giving it their all, it’s impossible not to do them same yourself. Changing the way people around the world thing about car ownership is definitely pretty high on the list. But when I’m not working, I’m very focused on my yoga and meditation practice, not only does it keep me sane with my crazy work life but I love the energy boost it gives me each day. I love to travel so much that it would be tough to pick a favorite place. I was recently had a chance to visit Bali and I’d say that’s definitely high on my list. We just launched in Washington DC in May 2015 and are focused on growing our east coast market. We are laser on expanding into major markets across the country, forging key partnerships to drive adoption and continued development of new product features and technology.